Despite the positive economic reports in Eurozone such as Unemployment rate in Germany and Consumer Price Index in France, EUR is not showing any signs of growth. 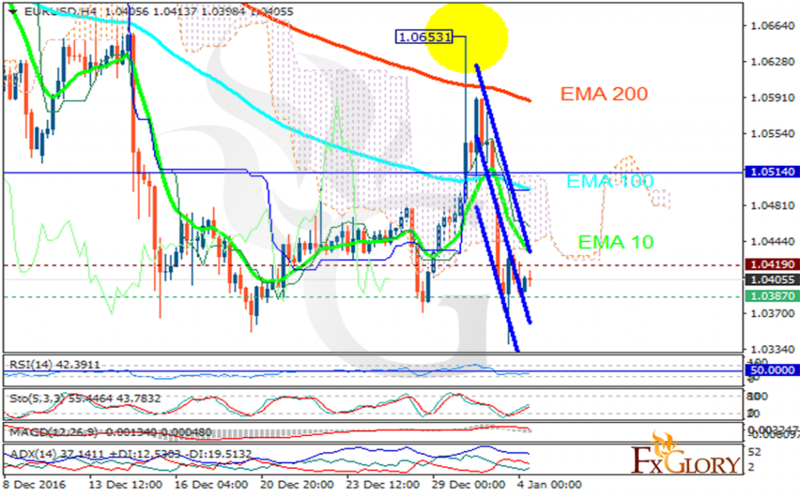 The support rests at 1.03870 with resistance at 1.04190 which both lines are below the weekly pivot point at 1.05140. The EMA of 10 is falling down sharply and it is below the EMA of 100 and EMA of 200. The RSI is moving horizontally below the 50 level, the Stochastic is showing upward momentum and the MACD indicator is in neutral territory. The ADX is showing a weak sell signal. The price is below the Ichimoku Cloud and it is above the Chinkou Span. The Tenkan-sen and the Kijun-sen are both showing downward trend. The chart seems bearish for today targeting 1.0350.